This is a simple, but very satisfying, pasta dish. The recipe is adapted from one in Arthur Schwartz’ Naples at Table. Arthur used spaghetti; I substituted linguine because that’s what I had on hand. 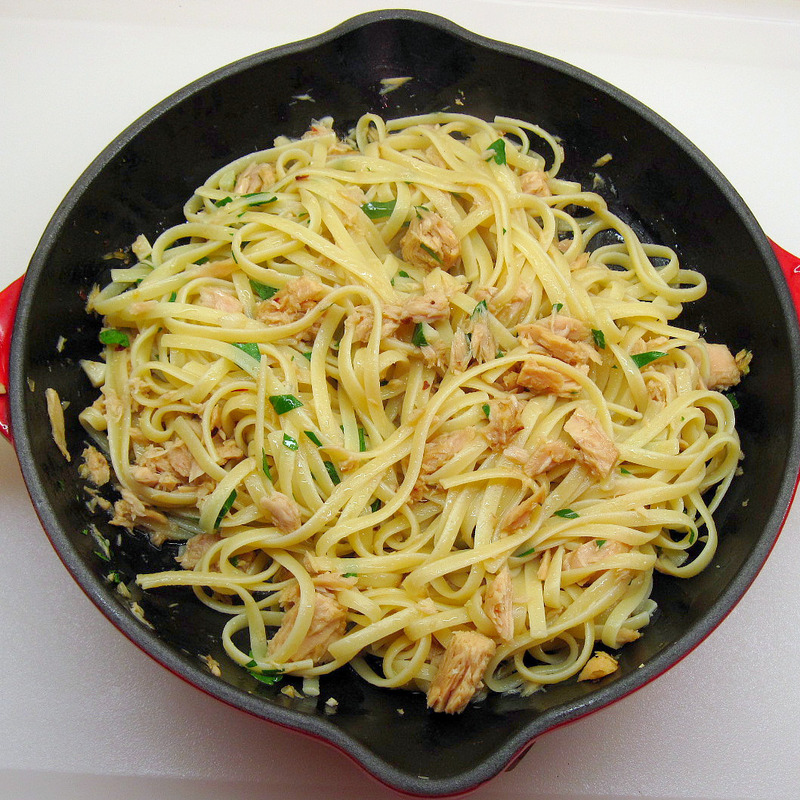 It’s important to use the right canned tuna. Solid, light tuna packed in olive oil is recommended. The olive oil is drained from the tuna and used to sauté the garlic. Because it is infused with tuna flavor, it adds a lot to the finished dish. I chose Genoa brand tuna; it’s one of the brands Mr. Schwartz recommended. I made a salad while the water was coming to a boil for the pasta. Then I chopped the garlic and the parsley. Everything was ready to go when I put the linguine in the boiling water. The sauce comes together very quickly while the pasta cooks. 1. Put a large pot of water on the stove to boil for the linguine. 2. Drain the tuna, reserving 2-3 tablespoons of the oil. 3. When the water is boiling for the pasta, add 2 tablespoons salt to the water, and then add the linguine. Stir and set the timer for 10 minutes. 4. Heat the reserved oil in a small skillet. Add the garlic and red pepper flakes and cook over medium-low heat until the garlic is fragrant and starts to color. 5. 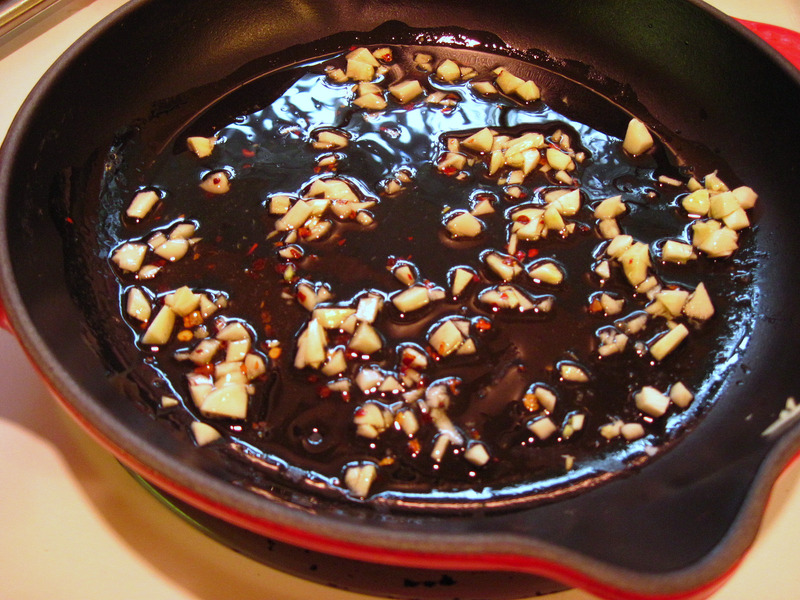 Remove the garlic from the oil with a spoon, and reserve. 6. Use a fork to break the tuna into chunks in the oil. Stir gently as it heats up. 7. When the pasta is done, reserve ½ cup of the cooking water, and then drain. the most important part was that you got good italian tuna!! I could see someone opening a can of starkist and not liking the results! You are so right, Dennis! You do NOT want to make this with water-packed tuna. The right tuna makes all the difference. 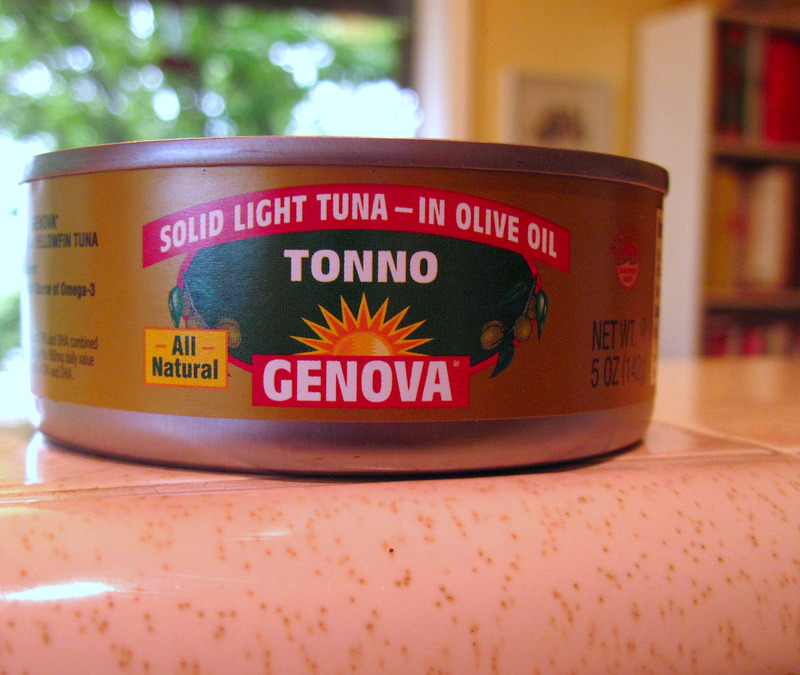 I was very pleased with the Genoa tuna, and I believe it’s pretty easy to find. I found it at my regular supermarket (QFC, for those of you in the Seattle area), and it was very reasonably priced. My aunt used to torture us with a similar dish but made with canned salmon. It’s been decades since I’ve eaten it, and now I sorta want to try it again. Maybe the tuna version. I’m personally not a big fan of canned salmon. 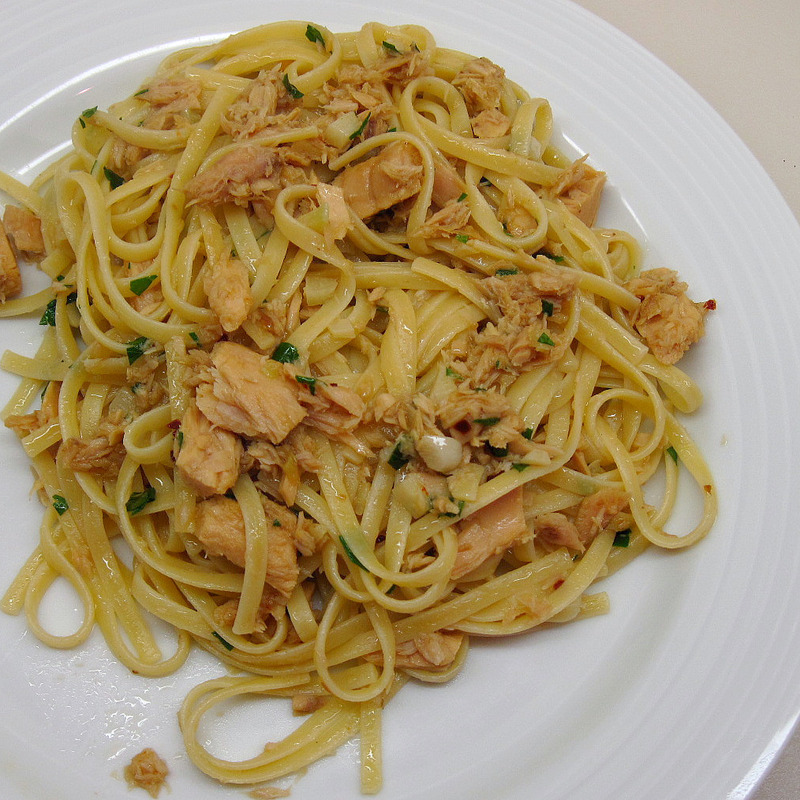 You may like this version if you get good canned tuna (preferably Italian) packed in olive oil.